Good Tuesday morning everyone. I hope your week is great so far. The weather here in Georgia has gone up slightly, but looking forward to a cooler trend this weekend. I love Halloween and you definitely need it to be cool for the costumes. We have Trunk or Treat at our Church and it’s always a blast. We serve hot dogs and hot chocolate along with all the candy the kids can fit in their bags. I can hardly wait. As for upcoming releases, my author friend V. Steele has a new release this Friday. V is from right here in Georgia and she loves a good romance. 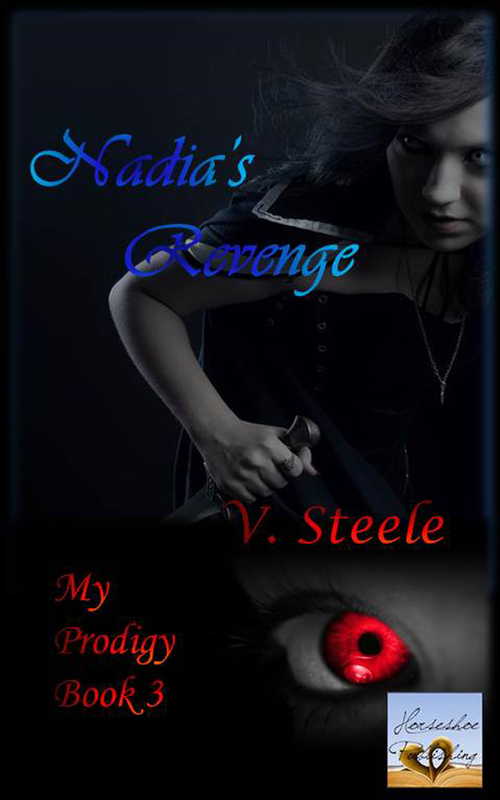 Her My Prodigy Trilogy is coming to a close this Friday with the release of Nadia’s Revenge. Since she uses my publishing service, Horseshoe Publishing, to create her covers and do edits, I was able to read it before the release. Since I do enjoy vampire romances, I enjoyed this one. But let me warn you, the this book has some violent elements, but in the end it’s really good. V effectively ends the series. I look forward to some of the new things she has coming out. We have many things in common, the main thing being we both love a good romance. Since she’s a Georgia girl too, well it just makes it all the better. The book is on Pre order at Amazon until Friday and then it will be up for sale. So check it out! For the second release, I’m pleased to announce that the article I was asked to write for Southern Writer’s Magazine will be out soon. I approved the final draft yesterday and am really excited about it. If you don’t already subscribe to Southern Writer’s Magazine, then I suggest you check them out. They offer so much for authors and work closely with you. Also they support authors at every turn. I’m proud to be a subscriber of their magazine. Categories: Uncategorized | Tags: Amazon Preorder, Author, Books, friends, Georgia, Georgia Writer, new release, Southern Writer's Magazine, V. Steele, vampire romance, Writers, Writing | Permalink. Ok, on to today’s thoughts. As most of you know I self publish all of my books. It’s a decision I made for myself. Don’t get me wrong, I’d love for one of my books to be picked up by one of the big guys, but if not, that’s alright too. I’ve had a couple of publishers call me to inquire about what I have coming up, but once we talked about the percentage of royalties and what they’d do for me if I put my book with them, well I politely turned them down. I’m a person that researches things a lot, well sometimes too much. I’ve looked into the good points and bad points of going both ways and when I look at the numbers, self publishing wins every time. I have control of what, where, when and all the things that happen with my work. I also make more in royalties than if I went with a publisher. The tools available now for authors allow you to make awesome covers and publish really great looking books. There are so many outlets for self publishers to post their books for sale and advertising. It’s amazing the rise in just the last two years of the acceptance. You might be saying, but wouldn’t you sell more with the big publishers. Maybe…but when I talked with one of them, they told me that I’d have to do a lot of advertising and social media myself, which I already do anyway. They didn’t offer very much in the way of marketing, well no more than I do now, so why do anything different. This is a choice I made for myself. Now a big publisher might be the best fit for you, so understand that I’ve just not had a really good deal thrown at me. The couple I did get just didn’t push the right buttons. Self publishing is more widely accepted now than it was years ago. I’ve actually seen big, NY Times Bestsellers come from self published authors. Many big authors are going back to self publishing. That tells me something. Categories: Uncategorized | Tags: Authors, Covers, Publishing, Romance, self publishing, traditional publishers, Writers | Permalink. Good Wednesday morning to everyone! It’s a beautiful, chilly morning here in Georgia. I just love the crisp air that Fall offers. It’s so invigorating and refreshes my soul. I begin to get more itchy to write which is scary because some days I could write for 24 hours a day. Yikes, that sounds a little obsessive, but if you’re a writer you know exactly what I’m talking about. 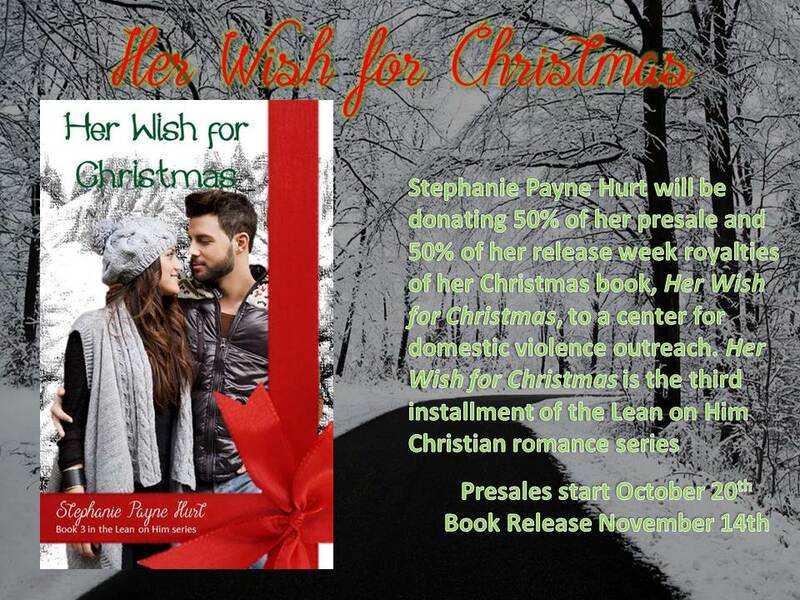 I’m currently working on Her Wish for Christmas, the 3rd book in my Lean on Him Christian Romance Series. This book has torn at my heart and brought me to tears several times. I thought book 2 in the series, Faith Through the Tears was bad on my nerves, well this one has totally cleared out my tear ducts. Actually had a fan recommend sending out a box of tissues with each copy sold. If you’re wondering why it brings me to tears, well it’s a book about a problem that plagues this nation and it’s something that just affects me so deeply. But it’s the reactions of the characters that totally takes me by surprise. If you’re not a writer, the last statement might seem strange, but sometimes as writer’s we’re surprised by how the characters take over. Also, for this book, it’s on pre order through Amazon until the release date of November 14th at http://www.amazon.com/Her-Wish-Christmas-Lean-Book-ebook/dp/B00OJI0BN0. I’m donating 50% of my royalties from all the pre order sales and first week after release sales to a domestic violence charity. I want to help out with making a difference. This is such a problem and it breaks my heart that so many feel they have nowhere to turn. The first couple of days the pre order was out it was in the top 100 on Amazon which is exciting. I’m so touched by the response to this book and can’t wait for it to be up and running. Since the book is almost completely through the editing process I’m crossing my fingers that maybe this book can inspire someone to speak out and get help. Categories: Uncategorized | Tags: Amazon, Christian, Christian Romance, Christmas, Christmas Romance, contemporary romance, Domestic violence, Faith, family, Love, Preorders, Romance, Writing | Permalink. As a writer I’m constantly trying new ways to organize me thoughts for books. Some days my mind is riddled with different scenes and it’s hard to concentrate on just one part. So I’m trying a new way to do things that I’ve read other authors do. Since my mind seems to want to go ahead of itself, I’m letting it. When I start a book now I also start another word document that I name Segments of “book name”. In this document I write the scenes that are later down the road, that way I don’t lose the thought process and also it helps with the current parts. I know where they’re headed and can keep everything flowing in the right direction. I’ve noticed that my mind seems less tangled when I do this process. I guess getting the parts that are screaming at me on paper helps the words flow better without obstacles. Try this process out and see how it works for you. But don’t forget to label each section so that you can copy and paste it in when your writing gets to that point. It really helps! Categories: Uncategorized | Tags: Author, avonromance.com, Books, Confusion, direction, help, Publishing, romance author, scenes, writer, Writing, Writing Process | Permalink. How many times have you asked yourself or someone else the famous question, What if…? Since I’m a writer and a dreamer I’m constantly saying What if… It’s part of my make up. The dreamer in me always has another way to do things and the writer in me says what if this character does this or goes there. What if… I turn a book into a big publisher and they accept it, signing this big contract and a nice advance. What if… My newest book goes viral. What if… What if… What if… We’re full of lots of them, even if we don’t think we are. Think about it. How many times do you say this one simple phrase in a day, whether out loud or in your mind? You might be surprised. It only means you’re a dreamer. Think about it. Categories: Uncategorized | Tags: dreams, Imagination, Publishing, thinking, Writers | Permalink. Good Tuesday morning. I hope everyone is safe and well. We’ve had a nasty round of weather here in the South and let’s just say it’s still really dark here. When you pick up a book you’re taking a chance on that author. What if it’s an author you’ve never read or your favorite author? Either way you’re supporting that author. If you like the book it’s really important to send out a review. But what if you’re not too keen on the book, well still do a review, but don’t be nasty. My rule of thumb when doing a review is to be honest and think of how I’d want a reader to respond. If it’s great then shout it to the world. If it’s alright, then give it a review that states it’s an alright read and maybe give some of it’s attributes if it has any. But what do you do if it’s horrible? I’ve read some books that I just barely finished and others I never finished, even though I really truly tried. It’s time to review, but what do you do? Well, I think you need to leave a kind review. What’s that mean? It means don’t degrade the author with comments like “I couldn’t finish this book because it was horrid” or “This book stinks, don’t go near it”. Maybe say something like “This book wasn’t my style, but I tried it out”, which leaves it open for others to try. I like the reviews that mildly state a couple of issues with the book, but not by cutting the author to the quick, but by making a couple of suggestions. I’ve actually used some of mine to refresh my skills. A comment I had on a review one time that really steamed me was that I left the book on a cliffhanger to get more money out of the reader by making them want to buy a book. She went on to say she wouldn’t buy another of my books because of it. The funny thing is that it clearly states it’s part of a Saga, which should have clued her in that it didn’t end with that book and she read it all the way through. Oh well. My point is this, give your authors some love. We work really hard and spend a lot of time writing to get that book out there so give us something to work with. Good thing we don’t price our books by the hours we work on them. But it’s so worth every hour spent over the keyboard. Categories: Uncategorized | Tags: Author Support, Authors, Book Reviews, Kindness, Reviews, Writer Support, Writers | Permalink. Good morning peeps! Hope all is well with everyone this morning. As for me, it’s the end of tax season and I’m trying to get out the last few returns that are still hanging out on my desk. But first things first, I’m working on my Christmas romance this morning early. Oh, you haven’t heard about it, well let me fill you in. As some of you know I have a Christian Series “Lean On Him” that I’ve written two books in. Well this is the third installment. It’s called “Her Wish For Christmas”. This book has been working on me for a while, but I wasn’t sure just how to get the story across to my readers. Well, guess what, I’ve figured it out and hope it helps someone out. The book is about domestic violence and how a couple finds their way through it. I’ve been researching many avenues of domestic violence and the statistics were scary. Did you know that many of us are friends with or work closely with someone that’s a victim of domestic abuse and we don’t even see the signs. In this book I’m only hitting the surface of the problem, but I just hope to add a little hope to someone that feels like they don’t have anyone to turn to. I’ll leave it at that for the moment. Let’s just say I’ve shed many tears writing this one, even the outline tore my heart out as I imagined the woman’s pain and even the man’s pain as realization hits. As for this weeks happenings I had an interesting call Friday. I’ve been chosen to be interviewed live on the radio tomorrow for my accounting business. It’s through the WRNW Radio network which is a Women’s Radio Network. They place women business leaders in the limelight for 8 minutes as they interview them and try to inspire other women with their story. I’m really excited and you know I’ll be mentioning my writing. Not sure what radio station it is, but I’ll let you know when I know. The interview is at 4:30 tomorrow afternoon. Wish me luck! Categories: Uncategorized | Tags: Author, Domestic violence, Interviews, Radio, Writing | Permalink.